Abstract: The output of Q-switched fiber lasers often exhibits complicated temporal features such as multiple short spikes. The article shows how can these be understood and simulated with a dynamic fiber laser model. When a fiber laser is Q-switched, one often does not obtain a clean pulse shape as for most Q-switched bulk lasers, but rather a complicated shape with multiple peaks. A variety of explanations for such phenomena have been presented in various research papers, partially involving nonlinear effects. Even without any nonlinearities (apart from the effect of gain saturation), such effects can arise, as it has been explained in the paper cited above, although perhaps not with the desirable degree of clarity. What is needed to understand this is a laser model which takes into account the spatial distribution of optical powers and the excitation of the laser dopant in the active fiber. I have simulated such phenomena with my software RP Fiber Power, which can spatially resolve the excitations in the fiber in the longitudinal and transverse dimension (although the latter is not essential in this context) and (since version 2) is also suitable for dynamic simulations. The figure below shows with a logarithmic scale how the power of a Q-switched fiber laser evolves with time after opening the Q-switch. The (very fast) Q-switch is located on the left side of the fiber, whereas the output coupler (a fiber Bragg grating) is on the right side. Figure 1: Output power and ytterbium excitation in a Q-switched fiber laser versus time. Before opening the Q-switch, there is already some small output power due to amplified spontaneous emission (ASE). After opening the Q-switch, it takes half a resonator round-trip time to see a change of output power. Then, however, the output power immediately goes to a very high level, as the initial single-pass gain is very high: ≈40 dB. That power multiplied with the round-trip time is already of the order of the saturation energy, such that substantial energy is extracted with one round-trip time. Therefore, the gain drops quickly, and there is some decay of output power. After another round trip, the remaining (already partially saturated) gain is sufficient to drive the power still higher, but only for a short moment of time, as the gain is now saturated very quickly. During subsequent round trips, that spike pattern decays more and more. The power drops well below the initial ASE level, as the gain is now close to zero. Such behavior is not found in most Q-switched bulk lasers, as these have a much lower gain. In that case, it takes a significant number of round trips for the power to reach its maximum, and such pronounced temporal structures do not occur. However, there can be beating noise when multiple longitudinal modes are lasing. Of course, nonlinear effects (which are neglected in this simulation) may modify some details of the results, but they would hardly change the general behavior. Note also that a slower switching speed of the Q-switch can substantially modify the results. 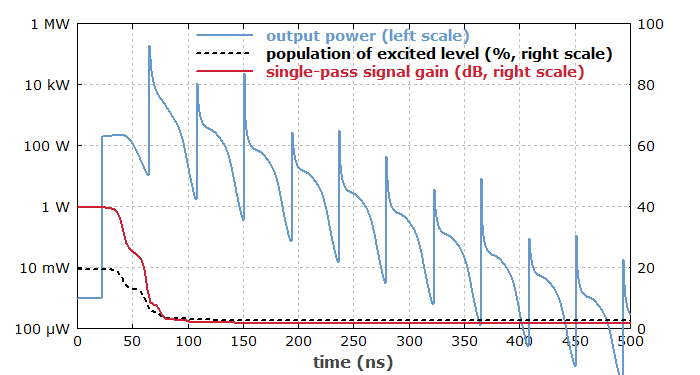 We learn from such simulations that the pulse generation in Q-switched fiber lasers is substantially more complicated than in bulk lasers, at least when the gain is high. (For mode-locked fiber lasers, the pulse generation is also more complicated than in bulk lasers, although for entirely different reasons.) Certainly, one should be aware of such effects, and ideally be able to simulate them, when developing a Q-switched fiber laser.